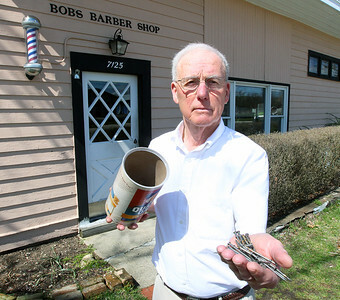 H. Rick Bamman - hbamman@shawmedia.com McHenry Township trustee elect Bob Anderson shows on Thursday, April 6, 2017 some of the 56 scaffold duplex nails he and customers found in the parking lot of Bob's Countryside Barber Shop in Wonder Lake. H. Rick Bamman - hbamman@shawmedia.com McHenry Township trustee elect Bob Anderson cuts son Chris Anderson's hair on Thursday, April 6, 2017 while talking about how customers found nails behind their vehicles in the parking lot of Bob's Countryside Barber Shop in Wonder Lake. 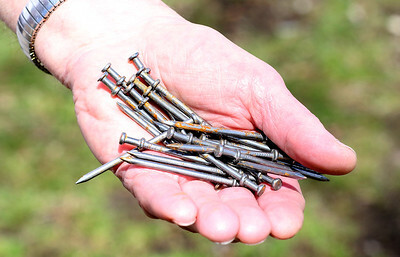 H. Rick Bamman - hbamman@shawmedia.com McHenry Township trustee elect Bob Anderson holds on Thursday, April 6, 2017 some of the 56 scaffold duplex nails he and customers found behind their vehicles in the parking lot of Bob's Countryside Barber Shop in Wonder Lake. 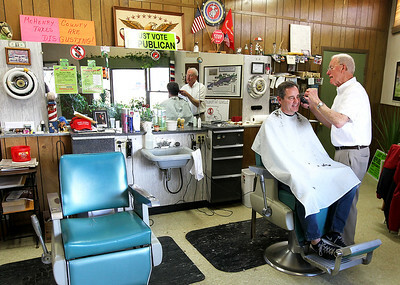 McHenry Township trustee elect Bob Anderson cuts son Chris Anderson's hair on Thursday, April 6, 2017 while talking about how customers found nails behind their vehicles in the parking lot of Bob's Countryside Barber Shop in Wonder Lake.